On Sale Now! 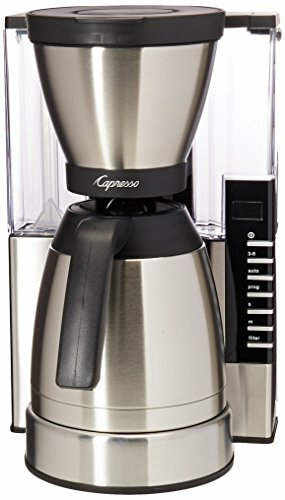 Save 10% on the Capresso 498.05 MT900 Rapid Brew Coffee Maker, Stainless Steel by Capresso at Jakis Cafe. MPN: 498.05. Hurry! Limited time offer. Offer valid only while supplies last. The Capresso 10-Cup Rapid Brew Coffee Maker quickly brews a delicious, rich pot of coffee in just 7 minutes for richer coffee with less bitterness. The Capresso 10-Cup Rapid Brew Coffee Maker quickly brews a delicious, rich pot of coffee in just 7 minutes for richer coffee with less bitterness. An extra-large showerhead saturates grounds in the brew chamber for a full-flavored extraction, and the MT900 comes with a reusable gold-tone filter and stainless steel vacuum thermal carafe. This stainless steel model adds sleek, modern style to your countertop.